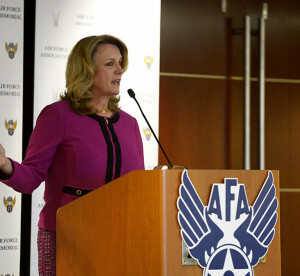 Air Force Secretary Deborah Lee James speaks to attendees at the Air Force Association’s Breakfast Series in Arlington, Va., Jan. 6, 2017. The Air Force Association’s Breakfast Series brings together industry partners, the international attaché corps, and both military and civilian leadership for informative briefings on a monthly basis for updates on relevant current initiatives. Air Force Secretary Deborah Lee James addressed the Air Force Association’s Air Force Breakfast Series Jan. 6, at the Key Bridge Marriot in Arlington, Va.
James began her presentation by reflecting on her appointment as the 23rd Secretary of the Air Force. For more than three years, her focus remained steadfast with three priorities: taking care of people; striking the best balance between the readiness needs of today and the need to modernize; and making every dollar count. When she took on her new role in December 2013, the wars in Afghanistan and Iraq were winding down, the thought was that there would be fewer overseas deployments, less threats and more emphasis on having Airmen at home, and more opportunity for home station training. According to James, it looked like an opportunity to rebuild full spectrum readiness and reset the forces. At the time, she was briefed the plan for a smaller Air Force and the budget she inherited reflected that plan. The plan included reductions in personnel and equipment that needed to be modernized. “It made sense in late 2013,” the secretary said. Then 2014 came. She discussed Russia’s invasion of Crimea; the emergence of Islamic State of Iraq and the Levant, China stepping up its efforts to create artificial islands in the South China Sea, and North Korea redoubling its efforts on advanced ballistic missiles. At the same time, she started traveling around the Air Force to meet Airmen and was surprised by what she discovered. She realized the briefings and assumptions that had been made in Washington were not adding up and concluded the Air Force needed more people, not less. By the summer of 2014, the Air Force halted its next planned phase of involuntary downsizing, and instead, began reversing the trend seeking additional funding for personnel and modernization. People issues have continued to be her top focus throughout her tenure. Operational requirements have continued to grow, especially for intelligence, surveillance, and reconnaissance missions. “The [Remotely Piloted Aircraft] mission didn’t even exist 15 years ago, and now – now – it is central to everything we do in the fight,” James said. She elaborated by sharing that roughly 20,000 people were assigned to the RPA mission in a time when the Air Force was reducing in strength by approximately 40,000 people. “The appetite for the capability was insatiable. It was difficult to keep up with,” she explained. As that demand continued, retention became a problem. That is why the RPA get-well plan was launched, James said. 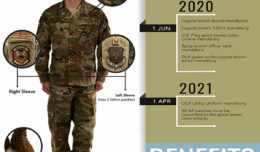 It included doubling the training pipeline, more use of Air Guard and Reserve forces, a temporary decrease in the number of combat air patrols, increasing the RPA pilot retention bonuses, putting into place an expanded basing structure for quality of life concerns and reintroducing enlisted pilots for the first time in 60 years. She elaborated on the Air Force’s aging inventory and about the new aircraft that will be added, which in-turn, will drive requirements for an increase in maintenance and skilled maintainers. She went on to talk about quality of life issues, which include keeping compensation for military competitive with the civilian sector and safeguarding retention bonuses and other benefits. 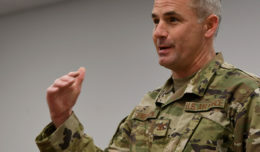 Quality of life issues also include safeguarding Airmen’s time, James said. There have been reductions in computer-based trainings and additional duties with the intent of giving Airmen more time to perform their primary mission. As part of this ongoing effort to recruit and retain talented Airmen, requirements regarding accessions are being updated. Updates including changes to tattoo and medical policies that had previously barred people from serving is expected to be released next week. The secretary went on to talk about balancing readiness with needed modernization. That includes funding and upgraded training, such as for exercises, base ranges and simulations. The top acquisition priorities continue to include the F-35 Lightning II, the KC-46 Pegasus, the B-21 Raider and the new combat rescue helicopters. James then articulated the expansion of the space mission. Recent progress includes the Space Enterprise Vision, updated training and doctrine and the creation of the Joint Interagency Combined Space Operations Center. 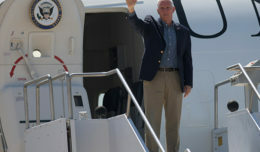 The priority of making every dollar count has also made progress, James said. “This is all about recognition of the fact that we are entrusted with the taxpayer’s money, and that money is precious, and we need to be as efficient as possible,” she said.